It’ll be just like this. 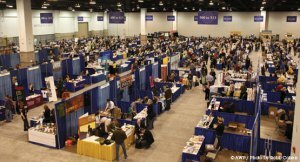 Another year of AWP has drawn to a close, and countless editors, writers and journal staffers are heading back to their home institutions with swag bags, connections and newly autographed books. First, stock up on wine. You’re going to need a lot of it. Start with half a plastic cup of unfortunately-sharp white as you pull from your shelves every literary journal, small-press book, and poetry collection you own. Arrange the books on your dining or coffee table in a pleasing display. Rearrange three times. Settle on the original arrangement–it should be about the work.